Sophomore Patrick Harper’s three-point effort vs. Quinnipiac—2 goals and an assist on the overtime winner—earned Hockey East Player of the Week honors, just as he did the first week of the season a year ago. Shane Bowers, who scored the overtime winner against the Bobcats, and Jake Oettinger—53 saves on 56 shots in his first two games—were named to the weekly list of top performers. Terriers remain at #2 in the USCHO Weekly poll, receiving five first place votes while Denver received the other 45 votes. BU also is #2 in the USA Today/USA Hockey Magazine poll and in ESPN’s John Buccigross’s “Cawlidgehawkey” Top Ten. ►In SB Nation’s Jeff Cox's ranking of the top 2017 recruiting classes in Division 1, BU occupies the top spot, followed by North Dakota, Denver, Massachusetts and Minnesota. 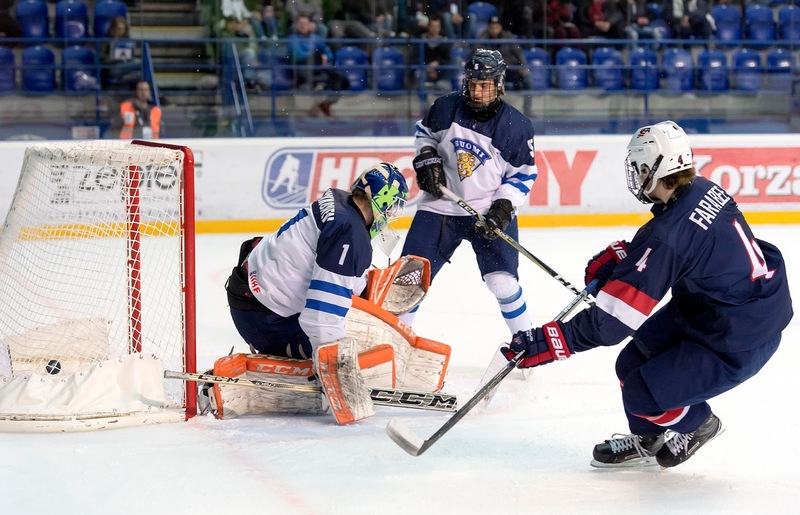 USA Today’s HometownLife.com reports on 10 NTDP U18 players expected to become impact college players and future NHLers, including BU 2018 recruit Joel Farabee, a projected first-round pick next June who racked up 50 points last year playing for the U17s and then for the U18s. Joel Farabee, forward, U-18: Farabee moved up to the U-18 team during the 2016-17 season and will be called upon in myriad key situations. His future college hockey home is Boston University. Four games into the NTDP U17s’ season, 2020 recruit Alex Vlasic (photo) is tied for the team lead in scoring with seven points (2G, 5A). The 6’5” blueliner, whose cousin, Marc-Edouard Vlasic, plays for the San Jose Sharks, has points in three of four games. Center Trevor Zegras, also a 2020 recruit, has six points (2G, 4A). 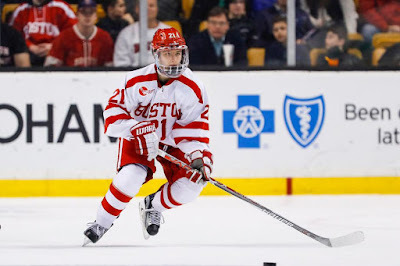 ● Daily Free Press: Terriers fall to Northeastern in series.